The recipe for these bars is one my favorites from Nourished. 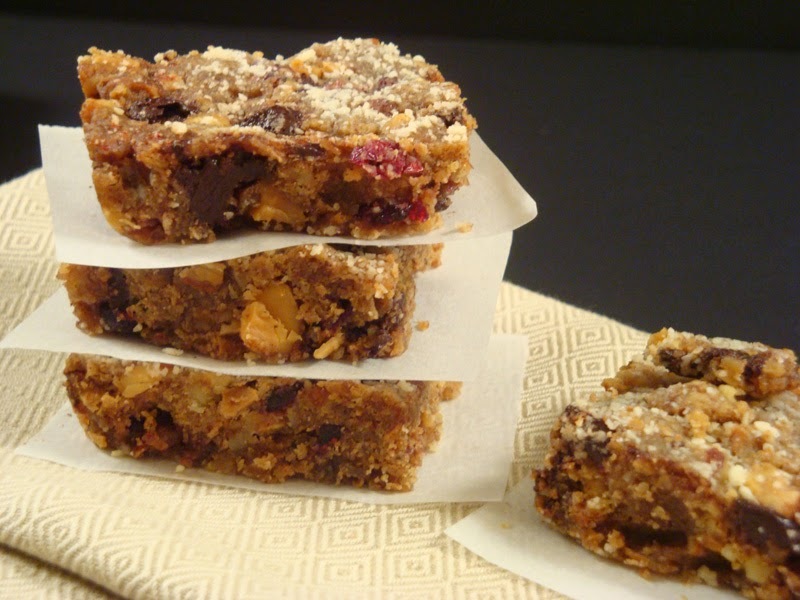 They make a healthful addition to your repertoire of holiday cookies as well as great bars for snacking. Wrap them in parchment paper and then in foil to use as a portable lunchbox treat, much less expensive than purchased protein bars. Preheat oven to 325º F. Grease an 8- x 8-inch pan and sprinkle with 2 tablespoons of the almond flour or meal. Spread nuts and coconut on a shallow baking pan and toast for about 10 minutes, stirring once, until golden brown. Let cool. While nuts are toasting, place nut or seed butter and coconut oil in a heat-safe bowl and microwave for about 30 seconds or heat in a small saucepan on stovetop until melted. Remove from heat. Stir until smooth. Add salt, vanilla, and liquid sweetener. Whisk or sift dry sweetener, whey protein powder, and reserved nut flour or meal together until blended. Stir into nut butter and coconut oil mixture. Place cooled nuts and coconut in bowl of food processor and pulse until roughly chopped, leaving some chunks for texture. Stir chopped nuts into batter. Add egg and mix thoroughly. Fold in cranberries and chocolate chips. Press bar mixture evenly into pan. Bake at 325º F for about 15 to 20 minutes or until brown around the edges. Don’t overcook. Any oil standing on the top should be absorbed as the bars cool. Sprinkle with a little more almond flour if necessary. Let cool in pan and slice into 16 squares. For easier cutting, chill in refrigerator for 10 minutes. Store in an airtight container at room temperature or refrigerate for a firmer texture. Chocolate, Coconut, Cranberries, Lunch Box Treats. Bookmark. Those look amazing! Thanks for all the sf/lc treats that I can enjoy while others are dining on full sugar varieties! What can I use in place of the coconut flakes? I love everything coconut, except shredded coconut. Anonymous: You are welcome. It's not hard to be good in the season of temptation if you have tasty treats that don't leave you feeling deprived. Your family and guests won't even know these are healthful if you don't tell them! Anonymous: You can just leave the coconut out. Or replace it with more nuts, chocolate chips, or cranberries. Anonymous: Another thought–is it just shredded coconut that you don't like? I prefer the large flaked kind. It doesn't get stuck in your teeth as much. Judy, thanks for your reply. No it's not just shredded coconut I don't like – it's the taste of coconut I don't like. Judy, just a quick question. How long will these bars last in the frig vs on the counter? Thanks. Always trying: Pretty much like any cookies: a couple of days on the counter, much longer in the fridge, almost forever in the freezer. If you use coconut oil, they will be soft at room temperature but firm when cold. Judy, what sugar free chocolate chips do you recommend? I like Nevada Manna http://nevadamanna.com/products/nevada-manna-sugar-free-chocolate-chips-8-oz-bag. However they are currently sold out. I sometimes make my own because most of the other choices are made with maltitol. Does anyone else have a source for good chocolate chips? Judy, these look great! When does the cinnamon get added? Oops forgot the cinnamon. I added it to the instructions. It goes in the order listed in the recipe ingredients, with the salt. Judy, Just saw this recipe and my daughter is highly allergic to coconut, what can I use in pllace of the coconut & coconut oil? Hi bake and sew. You can try using an equal amount of any other chopped nut or seed to replace the coconut flakes and you can replace the coconut oil with more butter or a no-trans-fat shortening. Thank you for all your wonderful recipes. I follow you on facebook, and am getting so excited to try so many new ideas. I have a question about protein powder. I recently purchased all the other ingredients in this recipe but I don't find this in a lot of the other recipes. Why do you use it? Is it a staple (like the almond and coconut flour or flax meal? Hi Patty. Thanks for the comment. Glad you found your way here and hope you will find it useful. What do you do if you don't have a food processor? Hi Dianne. I think this would work if you just chop things by hand or use a manual nut grinder. Can you replace the powdered erythritol? If so with what? Thank you! I loved the chocolate brownie flavor. I often travel so I want something which is easy to eat in flight. I tried 3 quest protein bars yesterday.